This is my 1995 BOY 22M Plastic Injection Machine along with my 2007 BOY 90M in back. The shop was finished on 2006 after a year of hard work. I run my own 3 phase conversion, which part of the controls can be seen on the wall to the right. Each machine has it's own chiller and temperature control unit to monitor the mold and hydraulic fluid temperatures perfectly throughout a run. Also, I have a dryer/hopper to remove moisture from the plastic before loading to the machines. Consistancy is the key. When others say they can machine plastic parts using a milling machine, they aren't getting the accuracy that is needed. Plastic will expand and contract very quickly and all elements need to be controlled. 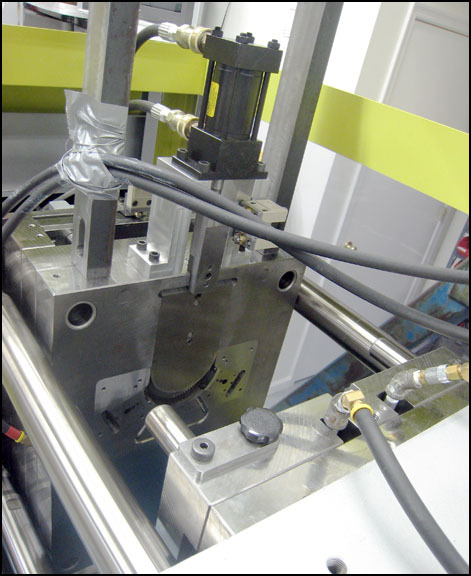 There is only one way to accurately make plastic parts and that is on an injection machine. Don't be fooled by others that don't even make their own product. This is the 22 Ton machine showing the mold base which makes the E36 seat gears. The hoses on top are the cooling lines for the moving side of the mold. They keep the temperature of the mold at 180 degrees when injecting the glass filled Delrin. 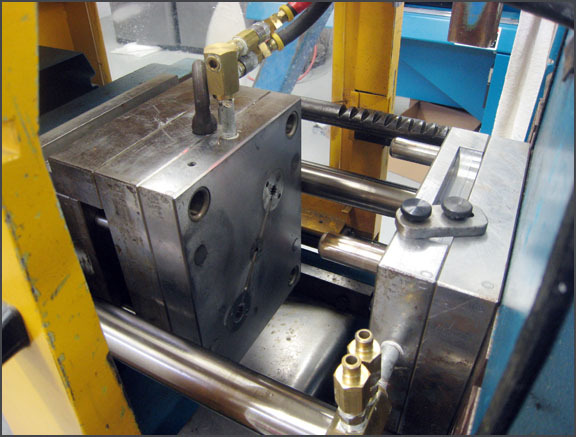 Each injection process will flow plastic at 400 degrees. With a closed loop system with the chiller, the mold can be kept within +/- 1 degree of the target. The cooling lines on the stationary side are not connected but would be if a run was being made. This mold base weighs about 600 lbs. This is the moldbase which makes the Mercedes Benz wiper assembly gear. The black box on top is called corepull. This is a hydraulic activated valve that will pull the center plate in and out of the mold. This allows the gear to be injected inside the metal mold base and still be able to eject the part when pulled open. This moldbase is 23 inches deep by 16.75 inches wide. It weighs about 1400 lbs. This is why I use the 2 ton gantry around the machine. To make this moldbase, it took around 6 months of planning, designing and building. I don't just wing a part. Everything is very calculated and researched. If you want a tour of the shop and a free fishing trip on the Chesapeake Bay, just give me a call anytime. If I can do it, I will.